We go the extra mile to make sure your stay is comfortable in this wonderful, just remodeled home in an excellent neighborhood. We just added window ac units in the bedrooms upstairs and ceiling fans to make you more comfortable in the summer! The home is within walking distance to Centennial Park, Arkansas River, downtown Canon City, the Royal Gorge train depot, zip line tours, rafting tours, restaurants, and other shopping areas. New furniture, new paint, new windows, new carpet and tile throughout. Relax on the back deck or by the fire pit overlooking a pond and open field that a family of deer frequently visit. Amenities include washer/dryer, full-size fridge, stovetop oven, microwave, dishwasher, toaster, blender, coffee maker (keurig), cookware, bakeware, silverware, utensils, dishes, shampoo/conditioner /body wash, hair dryers, iron and ironing board, premium mattresses, outdoor propane bbq grill, and fire pit. The cushions for the outdoor furniture and fire pit are kept in the garage during the winter, so please let us know if you intend to use them during your stay. Sleeping arrangements - Two bedrooms w/ king beds (one bedroom downstairs w/ own full bath and one upstairs w/ shared full bath), Third bedroom has two twin day beds w/ twin trundle beds, queen sofa bed in downstairs living room, and full futon bed in upstairs loft. Also provided for your use is Cable w/DVR, High Speed Internet, DVD player, DVDs, board games, children's books, and Nintendo Wii. Off street parking with room for parking an RV, utility trailer or recreational vehicles. Our main driveway is on the West side of the home. You'll need a smart phone with the Kevo application in order to lock and unlock the front door. However, we do provide a spare key in a lock box near the back door if you are more comfortable using an actual key. We will send you an ekey before your stay to use for the duration of your stay. You will need bluetooth on your phone to access the ekey. If you do not have a cell phone that is compatible, please let us know immediately after your booking. We are a military family with four children. We currently serve in the Army Reserve and are also practicing attorneys. Katie spent most of her childhood in Spokane, Washington and Byron in Denver, Colorado. Our family loves to travel and spend time outdoors. We fell in love with Canon City last summer on a family trip! This home was built in the 1800s, so it holds a piece of Canon City history. Deer routinely walk right by the house to graze near the field and pond in the back. Cable is controlled w/ charter spectrum remote. We supply reasonable amounts of paper towels, toilet paper, garbage bags, laundry soap and detergent, coffee pods, shampoo, conditioner, body wash, etc. Please do not attempt to shut off the vents downstairs because you will freeze the AC unit. There are new window AC units in the two rooms upstairs. It is an old house, so if the power trips, the breaker box is to the right of the back door. When departing: Please remove all used sheets and place on top of beds. Please place all used towels near the washing machine. If you have time to wash towels prior to leaving it would be greatly appreciated! Please either wash or put all dirty dishes in the dishwasher and start the dish washer before leaving. Please put all garbage in the garbage bin located on the side of the house near the back deck, and make sure the lid is closed. Please respect our things and leave the decor items in place. We have spent a great deal of time and effort to make your stay as enjoyable as possible. Super clean and all the amenities! This house is in the perfect location. It was super clean and had everything we needed for our stay! It was a real blessing! I would recommend this place! 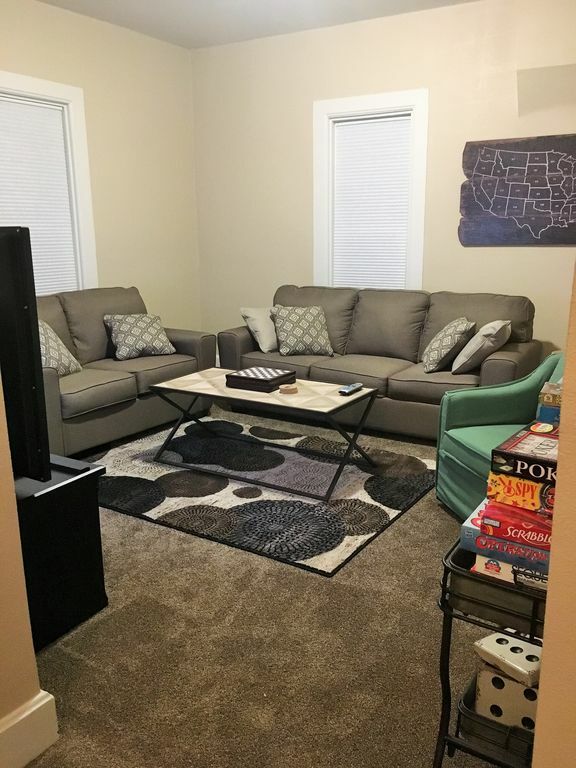 This house is well set up for families with kids' movies, video games, and board games. The neighbor has chickens and goats and let the kids see and pet them. The kids had a blast! The house is older but nicely remodeled and stocked with everything needed. The location is ideal near a park with a playground, the riverwalk, and the rest of town. Eight people shared this beautiful home for 1 1/2 weeks in August 2018. Our host, Katie, provided excellent service when we contacted her. She was professional and friendly and sought to make our stay the best it could be. We've rented several properties in our travels and this was the best-equipped home we've stayed at. Every morning and evening several of us gathered on the back deck (room for all of us to be seated comfortably) to chat and watch the myriad of wildlife come through the backyard. It was the perfect setting. The next door neighbors were very friendly and helpful. We cooked and ate most meals at the house, including grilling out on the back deck a couple of times. There was plenty of space in the kitchen for several people to help prepare the meals. The bedrooms met the need for us all with plenty of space. Having two master bedrooms was great. The additional bedroom and sleeping spaces were more than sufficient for our group. We enjoyed playing games provided at the dining room table while others made use of the large screen TV. We were in walking distance to Centennial Park which has a fun playground and water features fun for kids. We were also within an easy 15-minute walk into town. Every family member loved this home and location. We highly recommend this property and plan to book it when we are in town again. Great house. Great neighbors. Whole family enjoyed staying there. The City is located in a mountain bowl along the Arkansas River valley as it flows east from the Rocky Mountains and the mouth of the Royal Gorge. A combination of unique geography and an elevation of 5300 feet above sea level protect the city from harsh weather conditions, making Cañon City “the Climate Capital of Colorado,” with temperatures generally 10 degrees warmer in Winter than other nearby Colorado communities. The Royal Gorge Bridge, owned by the City, is one of the major attractions located near Cañon City. This, along with other nearby natural attractions such as the Arkansas River, the Pike-San Isabel National Forest, and the beauty of the surrounding land; draws numerous tourists to the area year round with a peak during the summer season. White water rafting, hiking, museums, the historic downtown, the Royal Gorge Railroad, and the Skyline Drive view and dinosaur excavation will make your visit a lifetime memory.